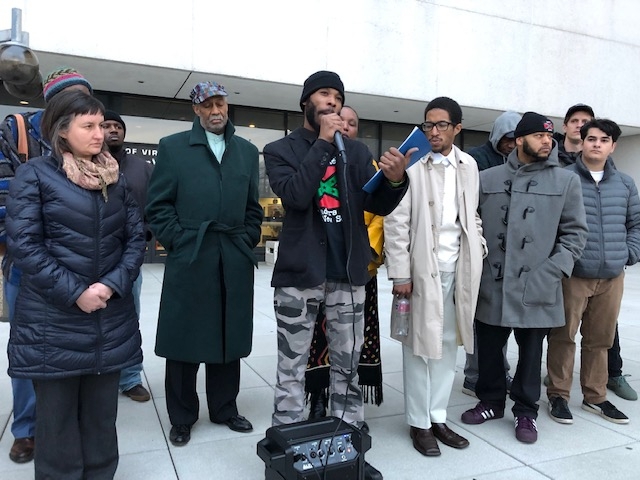 Photo cred: Whittney Evans/WCVE Photo caption: Omari Al-Qadaffi joined other activists Thursday to condemn recent changes to bus routes that they say discriminate against residents in majority African American neighborhoods. Community activists are asking the federal government to investigate whether recent bus service changes in Richmond are a violation of federal civil rights laws. Omari Al-Qadaffi has filed a federal complaint, alleging the transit company’s recent service overhaul has made it difficult for residents in predominantly black neighborhoods to access the bus system. This summer when the city added the rapid bus line Pulse, GRTC increased service in denser areas of the city and scaled back service elsewhere. In January, the transit company reduced the frequency of two more bus routes in the East End neighborhood of Fulton. Now GRTC may use the savings to expand service in the city’s West End. “That shows you blatantly that services are being removed from black neighborhoods and low-income neighborhoods and being moved to more affluent white neighborhoods, Al-Qadaffi said. GRTC officials said they reduced service on those routes from every 15 minutes to every 30 minutes because there weren’t enough riders. And they say the broader overhaul has led to a faster, more reliable system. The Federal Civil Rights Act of 1964 prohibits discrimination on the basis of race, color, or national origin in any program or activity that receives Federal dollars. In order to comply with that law, GRTC must perform an equity analysis before making any significant service changes. Carrie Rose Pace, a spokesperson for GRTC said the analysis performed in 2017, did not find any discriminatory practices. Al-Qadaffi said he’s skeptical of the analysis because it uses 2013 U.S. Census Bureau Data and not actual ridership numbers.